We are commonly asked what is an appropriate amount to tip the guides and lodge staff? My usual response is that it depends on how much effort you feel they put in to making your trip enjoyable. Some tip more and some tip less but most clients tip about 10% – 15% of the hunt price. We have an understanding amongst the guides and staff that tips are split between the team members. This eliminates competition between the guides and as a result they work better as a team, thus further contributing to the quality of your hunt. Also when you spend all your time with your guide in the field it is easy to forget how much effort is put in by the spotters behind the scenes, or the lodge staff cleaning the lodge or prepping for your next meal. This policy ensures that everyone is compensated fairly and keeps everybody working together to make your trip here the best it can be. If you are hunting with guys other than those you came with, you must first approve using your dog with the other group members before taking the dog into the field. If your dog is disrupting the hunt or causing birds to flare you will have to take him back to the truck unless the other group members all agree to him staying in the field. You must clean up any mess left by your dog around the yard. The place to take your dog to do his business is in the hayfield directly behind the lodge and the cabin. Dogs should stay in their crate either in the garage if you are staying in the lodge, or in the porch if you are staying in the cabin. Dogs are not to roam free around the lodge or cabin. If your dog growls, snaps, or acts aggressively towards other hunters or anyone at camp you will have to keep him in his kennel or on a leash for the duration of the trip. Under no circumstances can we have someone get bitten! Our camp is set up to accommodate one group of six hunters which is what we try to do whenever possible. If you book your hunt with less than six in your hunting party, you will likely be paired up with another partial group. Therefore we have to try and accommodate everyone’s hunting preferences. 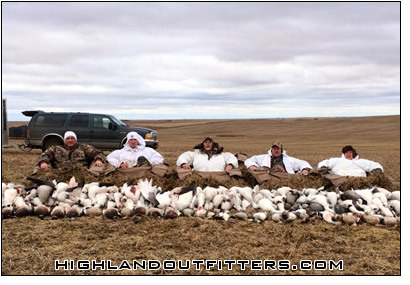 If you come here wanting to hunt ducks every evening and the other group hunting with you want to hunt Cranes or upland birds one day instead, you need to be prepared to do that. We will not hunt in two separate groups as our guides and spotting reasources won’t allow for it. Airport pick-ups are done between 12:30PM and 2:30PM. If your flight won’t be here by then you have three options. Fly in a day early and get a hotel, rent a vehicle and drive to camp, or call us and we will send another vehicle to pick you up (subject to staff availability and a $200.00 US service charge).